A Fred Cooper tractor, used in the oil fields as a 'Goat'. Cooper was the largest account Allis had with over 1100 tractors in the field. He also sold stationary engines and other Allis products. He died in his own airplane crash in 1946. 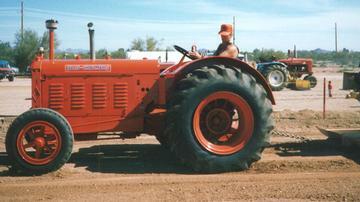 This tractor has 2 hand clutches and Bendix wheel brakes. Cooper always ordered the largest engine, this one has 5 1/4 x 6 1/2 cylinders at 563 cid. Produces 74 hp and uses 5 gals of gas per hour.